5.09 points at 11 votes (rank 767). Eagle Eye is a game from the Loadstar series, which is contained on the issue no. 087. As the name already says, the game requires "Eagle Eyes", which means you need very good eyes to succeed in this game. The game can be played alone or in pairs. The task is, to find an equal field to the one given in the middle. This you have to manage five times within a given time. For the whole task you have three lives available. In the first level, the given time is ample. From level to level the time diminuishes, so you get under pressure in finding the equal fields. Finding the equal fields is not always easy as every field contains several characters of different colours and so can easily mislead your eye. The build-up of the game field. The game is programmed in BASIC. For this it can be played very smoothly. 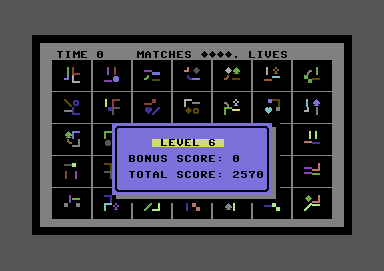 For the graphics existing ASCII characters and the 16 colours of the C64 are used. Sound is only played when there is a match or when choosing a wrong field. At the beginning you choose with 1 or 2 , if you want to play alone or with someone else. Then the screen is built up and the game can start. In the upper bar at the left, the time is shown. In the middle there is the number of already reached matches. If you have found a match a diamond will appear there. If 5 diamonds are there, you have reached the next level. At the leftmost the number of lives are shown with hearts. If the time is down to zero and you have not found all 5 twins, a heart will be deleted. The game is over when there are no hearts left. 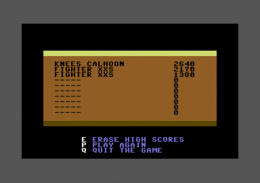 The game takes place on an area the size 7x5 = 35 fields, which renews itself after every try. At first the middle field is empty, after the buildup here the pattern appears of which you need to find the twin. This field is framed by a white line and another frame appears on the screen, which needs to be steered to the twin field. If you pick a wrong field this has no consequences. In the first level you have 45 seconds time. In the following levels the time is shortened by each 10 seconds. From level 5 on you have always 12 seconds to finish the level. 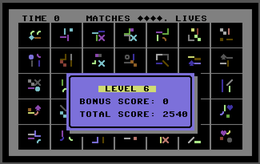 The points are given without consideration of the level. Per found combination you get 60 points. Per second that is left at the end you get 5 points. As the game area is built up randomly and anew with every game, there is no solution needed or sensible. No cheats are known yet for this game. Sledgie: "This is a very simple game, which however trains the eye. For this task it is done very successful. In (German) school grades I would give a three+. This corresponds to 8 out of 10 points." blubarju: "A nice little game to train concentration and power of observation. Unfortunately, there are no options except for the number of players. It would have been nice to be able to choose the difficulty grade which influences the available time and/or number of symbols. But altogether 6 out of 10 points from me." Camailleon: "Requires good eyes and high concentration as well as strength of nerves starting from level 4. A pity, that you don't get more points with higher pressure of time." No official cover is known for this game.